Reliance Jio kicked off its telecom operations in the September of 2016 and since then has shown no sign of slowing down. The company first ventured into prepaid data plans later on to postpaid plans. During its 41st Annual General Meeting of stakeholders and investors, the Mukesh Ambani led telco announced that it would also be commencing its operations in the broadband sector as well with the introduction of Reliance Jio GigaFiber. The telco said that the registrations for this new service would start on Independence Day – August 15. Also, two more dependable services which will be Jio GigaTV and Home Services will come with a setup box, will also be launched on the same day. The telco announced that initially, the service would kick start in 1,100 cities in India based on a priority basis depending on the interest which the cities get in the registration phase. The subscription to this service will also get the users Jio GigaFiber router and GigaTV set-top-box. Using the GigaTV STB subscribers will be able to make video calls to other GigaTV users or mobile users as well. Speaking about the net connectivity, with this new service Reliance Jio will make its entry into the Gigabit broadband sector meaning that the telco will use fibre optic technology to avail high-speed internet services to its subscribers, with speed running as high as 1 Gbps. The registration process for Jio GigaFiber services will begin on August 15 and Jio subscribers will be able to register themselves on MyJio app or Jio.com. They will only have to head over to the website or the MyJio app, where they will get a prompt for registration for the services, and they will have to follow a simple process. The registration process won’t be chargeable at all, and also subscribers will be able to register for JioPhone 2 on the website and app for which they will have to pay Rs 2,999. It is noteworthy that Reliance Jio won’t introduce its GigaFiber service as a standalone package but will include many other services with it. 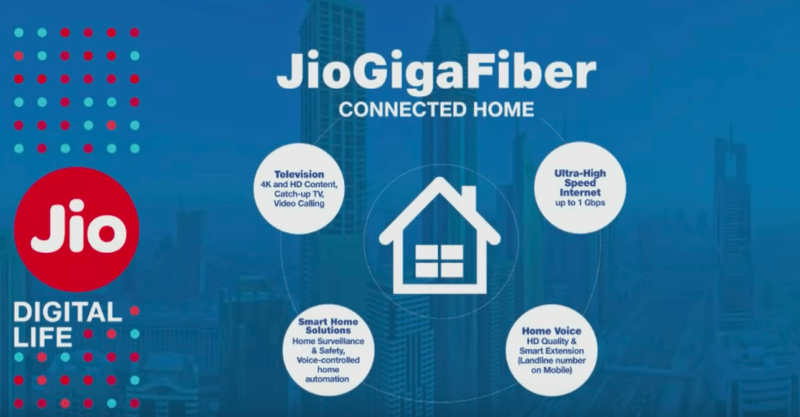 The Reliance Jio GigaFiber connection will come with Jio GigaTV set-top-box using which subscribers will be able to access more than 400 channels, unlimited movies and other content which Jio apps offer. This service will depend on GigaFiber for its functioning. Not only this, but the Mukesh Ambani led telco is living up to its promise of connecting India digitally. With GigaTV set-top-box subscribers will be able to make HD video calls to other GigaTV users or mobile phone users. In addition to that, Reliance Jio has also talked about virtual reality headset which subscribers can use to experience augmented reality, 360-degree videos and other VR based content right from the comfort of their living room; this again will be dependable on the Jio GigaFiber and GigaTV STB. Lastly, another dependable service on Reliance Jio GigaFiber will be the Smart Home Solutions IoT (Internet of Things) based products. Using these new products from Reliance Jio users will be able to increase security and protection on their premises. This line-up by Reliance Jio will include Audio dongle, video dongle, smart speaker, Wi-Fi extender, smart plug, outdoor CCTV, TV camera, indoor camera, smoke sensors, sirens, IR blasters, gas leak sensors and more. To get access to the latest services and products from Reliance Jio based on its Gigabit connection, interested people will have to go to Jio.com or MyJio app to register for GigaFiber services. The registrations will start on August 15 – Independence Day. God please no daily FUP plans. That will ruin the broadband of this country. Please NO. Cheap and no FUP is not good for Quality and it could effect no. of takers. Cheap plans like someone don’t think to stream and apps subscription packages like including Netflix to hotstar such that they play only after STB authentication…I mean stb subscription decides the package. I am using BSNL Broadband with Plan @ Rs. 249 in which i get Internet Speed @ 8 Mbps, Free Calls – BSNL to BSNL, Free Night Calls – All Network. Buy Amazon Fire TV stick or any similar dongle and then only you will realise . What realize?? Its very good at my uncle’s place…he disconnected dish and stream everything on firestick. His family happy with tv being free(500 before)and anytime watch. Free content on hotstar, zee5,voot, sonyliv, sunnxt(paid), YouTube (all news channels). I setup his firestick with my premium hotstar, sonyliv, sunnxt, Netflix, prime video account.. BSNL unlimited+ firestick works cool for him.